The large Bromeliad with that wonderful pink flower is Aechmea fasciata, also known as the urn plant. 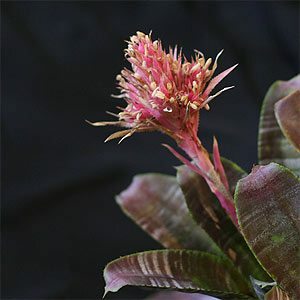 This is an easy bromeliad to grow, and with good silvery green banded foliage, plus that wonderful pink flower, can easily be grown in a container indoors or in the garden. This is an epiphytic plant originally from Brazil and nearby areas, the foliage has a natural arching habit, and when in flower is a standout indoor plant. And just to add to the variety, look for A. fasciata var. purpurea, green and purple foliage, (see picture at right) well worth looking for. A. fasciata primera is a ‘thornless form’. Being epiphytic, Aechmea fasciata requires a free draining growing medium. You can use a fine orchid mix, or a normal potting mix with extra drainage material mixed through. Watering is easy, simply flush out the central tank every 6 weeks and keep it 1/2 full with clean rainwater. The root system willed some water especially during summer, every 4 weeks in summer give it a good soaking and then let it drain. In winter only enough water to keep the growing medium from drying out will be needed. Fertiliser can be applied through a foliar spray in spring, a little extra applied to the root system at the same time should prove adequate. Repotting will only be required every 4 – 5 years. This is best carried out in spring. If you notice the growing medium remaining to moist, or ‘collapsing’ then repot earlier to avoid root problems. If you are growing this plant indoors, make sure it receives some good bright light at least every second week. This will improve foliage colour and flowering. In warmer climates you can grow Aechmea fasciata outdoors. In cool o temperate climates it is best grown in a container and overwintered indoors. As the flower spike is large and long lasting, use Aechmea fasciata as a feature mixed in with other indoor foliage plants. Wth good foliage and flowers this is Bromeliad that can add a tropical look to the garden, or patio. Use a free draining potting mix, such as fine orchid bark or cactus and succulent mix. Best grown in filtered light, so excellent for dry shade beneath trees. Watering is only required during very dry summers. Fertiliser needs are minimal. A little liquid seaweed fertiliser once a year is usually sufficient. The central ‘tank’ will fill with debris and leaf litter. You can flush these out occasionally with a gentle flow of water, or pick the leaves and debris out by hand.. The easiest method of propagation is by removing the side shoots or pups, Aechmea Fasciata can also be grown from seed. So these useful landscaping or potted plants are a real winner in filtered light to a partly sunny position in a well drained soil. We like to use a very fine orchid mix with Aechmea Fasciata to ensure good drainage, or mix in some sharp sand and perlite with a commercial potting mix (one without water retention crystals). Is this plant safe for cats and dogs? As far as we know this plant is not toxic to cats and dogs.